Growing up on New York’s Long Island, many of my closest childhood friends fell into one of two broad categories: Italian Catholic or Jewish. As a result, though raised in a Christian household I knew my Jewish prayers just as well as my Our Fathers and Hail Marys. I often spent Shabbat dinners at friends’ houses on Friday nights, celebrated holidays such as Rosh Hashanah with them, and as we all approached our early teenage years, attended more bar and bat mitzvahs than I could count. A consistent theme weaving all those events together was challah, a traditional, braided, Jewish egg bread. When this month’s Gluten-Free Ratio Rally tackled bread as its theme, I just knew we had to come up with our own version of challah. It’s been on our to-do list for much too long, and this was the perfect excuse. Though we let our bread brown just a bit too much, that result was purely cosmetic. The bread otherwise turned out fantastic. 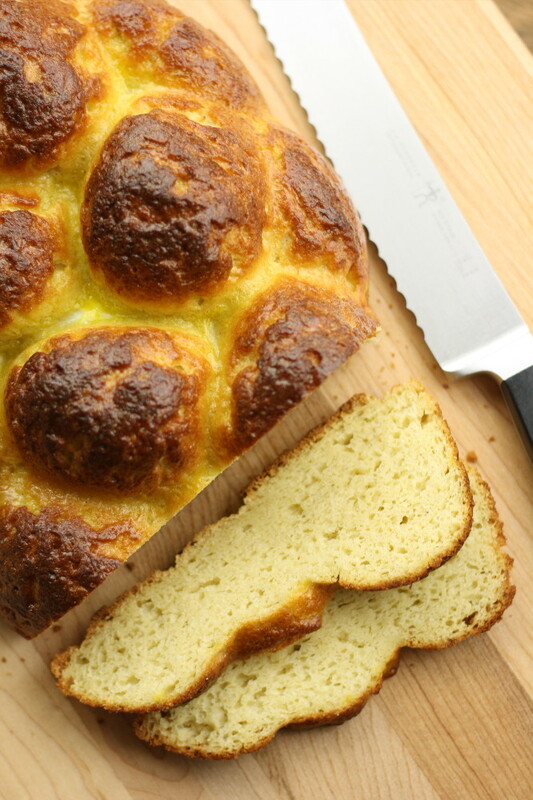 It is moist, tender, slightly sweet, slightly eggy … just as good challah bread should be. It’s great on its own, or used for sandwiches, or for French toast, or whatever. As for our final ratio, this one didn’t turn out nearly as cleanly as previous Ratio Rallies. Our challah ingredients by weight ended up with roughly 7.5 parts flour, 4.5 parts water, 4 parts eggs, 1.5 parts honey, and 1 part butter (plus a few additional items, such as yeast, salt, and xanthan gum). But that’s life. 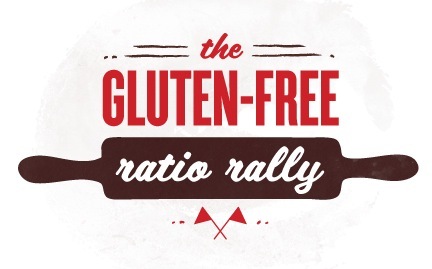 And while you’re at it, be sure to check out Cooking Gluten-Free!, where Karen is this month’s Ratio Rally host. There you’ll find links to more than a dozen other beautiful breads, including sandwich bread, boule, naan, and more. You can also check out past posts here on No Gluten, No Problem for other bread recipes, including pumpernickel bagels, Irish soda bread, sandwich bread, baguettes, and rosemary focaccia, to name a few. 1. In a mixing bowl, dissolve the sugar in the warm water, add the yeast, and let proof until the yeast is nice and active, about 5 minutes. 2. Add the honey, melted butter, and eggs. 3. In a separate bowl, whisk together the flour, xanthan gum, and salt. 4. Add the dry ingredients to the wet ingredients and mix well to form a smooth wet dough. 5. 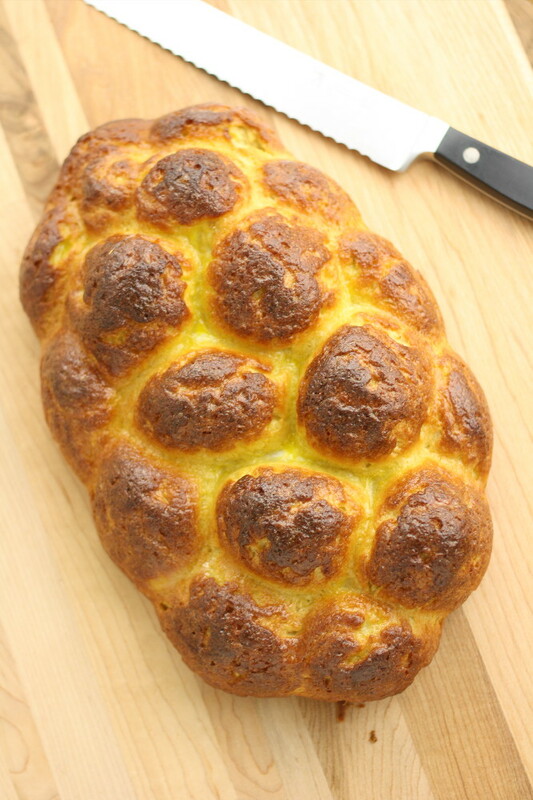 Brush a silicone challah mold with oil or spray with nonstick cooking spray. Add the dough. 6. Cover and let rise for one hour in a warm place, until the dough roughly doubles in size. 7. Toward the end of the rise, preheat your oven to 375 deg F.
8. Bake for 20 minutes, then turn out of the mold onto a baking sheet. Brush the top of the loaf with the egg wash, then return to the oven for an additional 15 to 18 minutes, until the top is golden brown and the internal temperature reaches about 190 deg F.
If your loaf begins to brown too quickly in the oven, you can always cover it with a piece of foil. UPDATE: Since several folks have asked … We bought our silicone challah mold through Amazon. It works wonderfully! If you’re not committed to the braided shape for the bread, you could use a variety of other pans, such as bundt, tube (angel food cake), and similar. Just make sure you have enough room for the dough plus the doubling in size during the rise. This recipe is: gluten-free, peanut-free, tree-nut-free, fish-free, shellfish-free, soy-free. This recipe is also effectively refined-sugar-free. To make it fully so, substitute honey or similar for the 1 tbsp sugar during the yeast proofing. 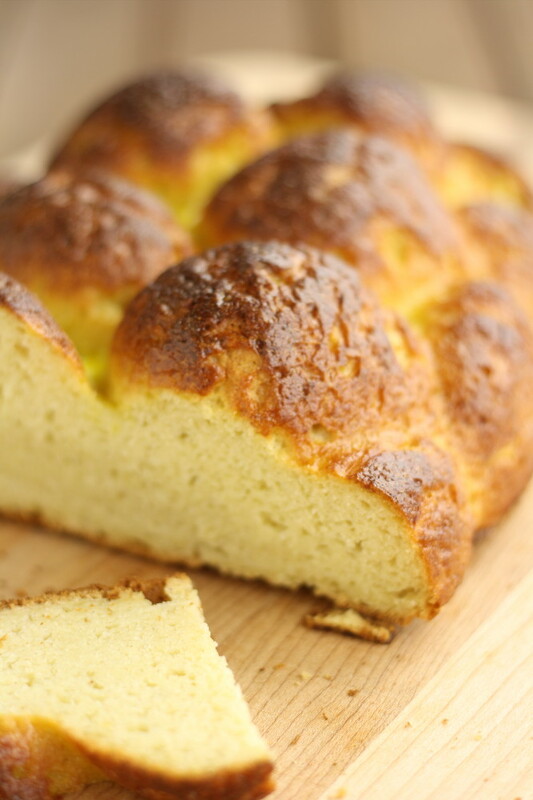 To make this recipe dairy/lactose/casein-free (important if you’re going to make your challah parve kosher): substitute canola oil or similar for the melted butter. Love the idea of a challah mold! We are also not Jewish, however before my diagnoses I would make French toast from challah a few times a month. We’ve been missing that very much. I cannot wait to try this. I love you. You know that? I’ve tried a lot of dreckishe (if you’re Jewish you’ll know what that means) challah recipes over the years. Can’t wait for this one. It’s a little early in the year, but have you done it with the raisins yet? That’s when I miss it the most. Rosh Hashanah with the raisins. I don’t even care about the shape, can’t wait to try this. Love all the bread varieties for this month’s challenge! Your challah is just gorgeous. We also have a challah mold, and you’ve inspired me to use it. Thank you so much for being awesome and motivating us with your amazing GFRR entry. This is such a beautiful loaf!! Congrats on a gorgeous looking challah bread, I can’t wait to try this!! Thanks for posting that baking mold! I was going to ask. Looks fantastic! That is one gorgeous loaf of bread. Thank you so much for sharing! I had no idea there were challah molds! I now have no excuse not to make a gluten free ‘braided’ bread. Gorgeous loaf, thanks for sharing! Thanks for the compliments, everyone! How did I not see your challah recipe until today? I have to make this over the weekend. I miss challah. Leave it to you and Kelli to save the day! I love this recipe. 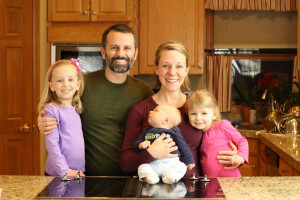 I am Jewish and find that we have many families in our Congregation that are Gluten Free. I would like to make this Challah for them on Shabbat. However, I have always braided my Challah and would not use a Challah mold enough to justify the cost. Can this bread be braided and hold shape normally? I see you can use other pans but it seems from the picture to be a pretty shallow loaf? Thanks again for the picture. You will not be able to braid this dough as it is very wet. It is hard to tell in the picture, but the loaf is quite large and I would recommend using one of the other pan suggestions. Alternatively, you could use two loaf pans, it would not fit and have rise space in one. I am SO EXCITED to find such a great bread recipe! 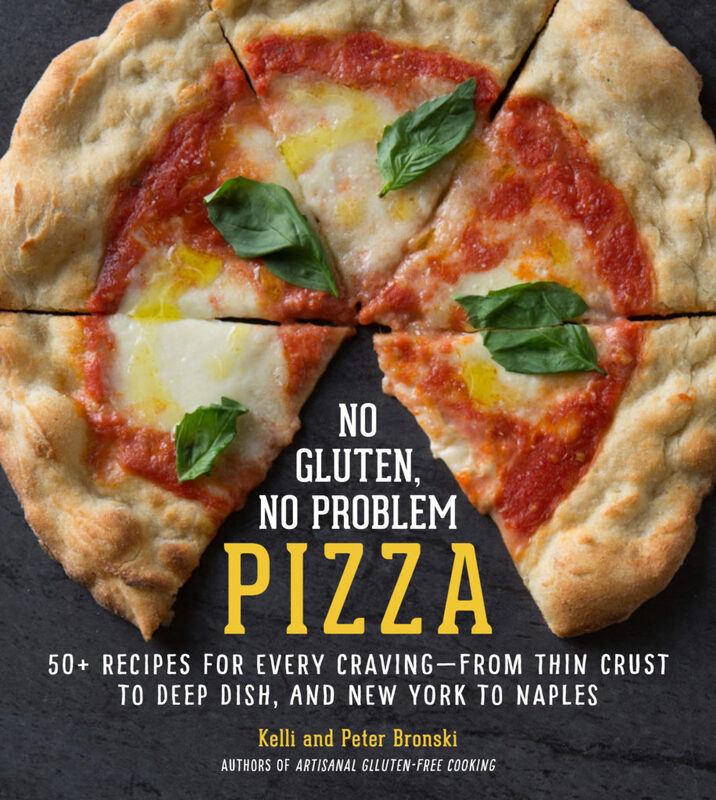 Can’t wait to share with my 96-year-old friend who has been gluten-free for more than 30 years (I’ve only been gluten-free for about 8 months). Now I need to find a recipe for gluten-free beer – and not that nasty sorghum-based stuff! I forgot to say that I used two plain large loaf pans, but I think it would have been all right in one loaf pan. The bread is delicious! Hi! I just finished eating 2 slices of this recipe & it is FANTASTIC! ! Though I must admit I’ve never had challah before today. I made this with a gf flour mix I made that’s very close to your mix. This was the EASIEST gf bread I’ve made yet, & I’ve been at this about 3yrs! I’m NO expert OR blogger just a simple girl trying to feel better by eating gf…. & NOT going broke while doing so! Regee – Yeah! We are glad you loved the bread. This is one of our favorites. It does freeze well. Just slice the loaf and freeze in a container with the slices laying flat in a layer, separated by parchment paper if you have multiple layers. You can freeze it with the slices all next to each other, but they tend to freeze together and you need to defrost the entire loaf instead of just being able to take out one slice. I can’t eat sugar, honey, molasses, etc. Can this recipe be made with any sugar free products such as stevia, xylitol, etc? If these products can’t replace ALL the sugar, can they replace part of it? I’m assuming the yeast needs some “real sugar” to ferment???? My two young girls were diagnosed with Celiac two weeks ago. We have challah every friday night at our Shabbat dinners and we were so disappointed with the frozen gluten free store bought challah we tried last week. It was really gross. We didn’t think that we would ever eat good challah again. I found your recipe, bought the silicone pan, and promised my family I would make yummy challah for them. It was my first time trying a real gluten free bread recipe. I was nervous when I put it into the silicone pan since it was not a consistency I was used to. It was very sticky and wet. But, when it was done baking, it looked beautiful. We sat down to dinner, cut into it and noted that it “looked like challah.” So one by one we tried it and everyone began to smile. It was delicious!!! Very close to what we are used to eating. We are thrilled!! Thank you so much for the great recipe!!!! Has anyone tried making this recipe with Earth Balance rather than butter? We try to avoid dairy. Thanks. Math4Fun – We have made it with canola oil and melted spectrum shortening and it has worked great both ways. Thanks for this recipe! I can’t wait to make it for Rosh Hashana. Does the dough act the same as regular challah dough – like, can I braid it myself easily? I wanted to make a round one for the holiday. Your challah bread looks AMAZING! Could you substitute the Artisan Gluten-Free Flour Blend and use Bob’s Red Mill Gluten-free All-Purpose Flour instead? Thanks! can i subsititue apple sauce for the butter? I am wondering if we can use the bread maker for this recipe? and can butter be replaced with anything? I am wondering if we can use the bread maker for this recipe? 2lb loaf?